Spending your vacation in one of the island’s best resorts is one thing, but opting for a beachfront villa in Aruba is an entirely different experience. 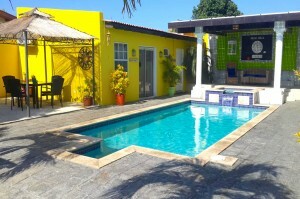 Villa rentals offer a level of privacy which no all-inclusive resort can provide, and an endless array of unique features including private outdoor pools, private tropical gardens, and ultimate isolation. They cost a little more in some cases, but a private beachfront villa in Aruba is most certainly the best way to enjoy this Caribbean paradise. Whether you choose to rent a five-bedroom luxury villa in Noord, or something slightly less extravagant, an ocean front villa promises an unforgettable Caribbean vacation and an experience that will far exceed your expectations. So let’s explore some of the best beachfront villas in Aruba! Merlot Villas, an exclusive gated villa community near Palm Beach. 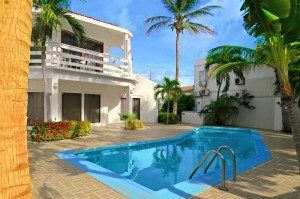 The Merlot Villas are spacious luxury beachfront villas with an outdoor pool that offer a fantastic getaway in Aruba. 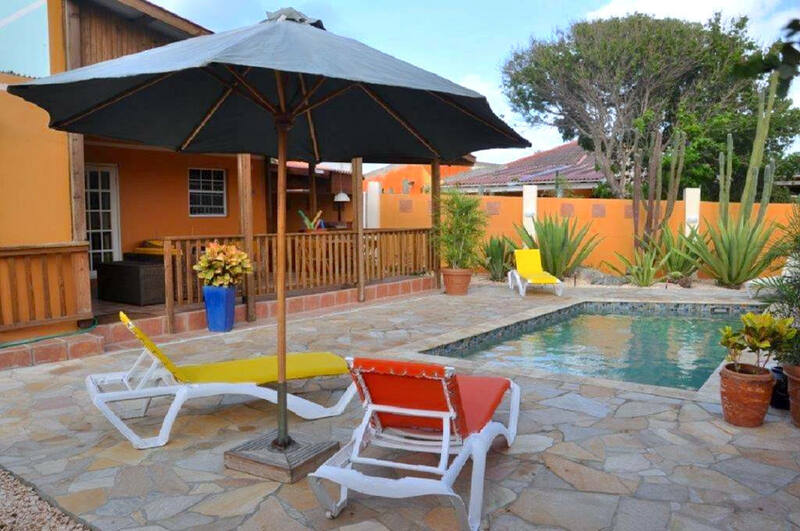 This 5-bedroom beachfront villa, located in Noord, is excellent for groups or families with kids who all would like to stay in a secure house in a small gated community. Every room is private, and features either a comfortable king or queen-size bed and has its own bathroom with shower and toilet. All 1st-floor bedrooms give access to the roof terrace which features sweeping ocean views and mesmerizing Aruban sunsets. The kitchen is fully equipped if you want to stay in and cook yourself. There’s a Mini Mart right across the street where you can pick up your groceries and other basic needs. If you don’t feel like cooking, the host can arrange a private chef. There’s an outdoor pool kids will love, and a superb poolside terrace with plenty of shade and deck chairs. If you and your friends or family would like to have dinner outside, there’s plenty of dining space and a big charcoal BBQ there as well. If you’ve arranged a rental car, which is advisable, just park it at the private parking right in front of the villa. If you’d like to explore the island by public transportation, the nearest Arubus bus stop is just 200 feet from the property. The property’s managers are known to be very friendly, professional, and quick to respond to any questions you may have. They’ll happily give you tips on things to do and places to go in the area. 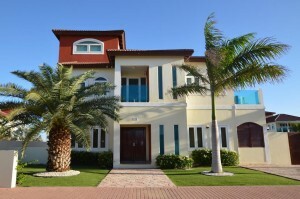 The Merlot Villas Aruba is close to numerous beaches and tourist hotspots. You can spend a gorgeous afternoon of sunbathing and swimming at Palm Beach, an easy ten-minute walk from the villa. Or for some great snorkeling if you are feeling adventurous, visit Malmok Beach which is also the most popular spot for windsurfing. If you’re looking for a secure home away from home, this is definitely one of the best places to stay in Aruba. Villa Florida, a great home away from home near Palm Beach, Aruba. Located in Noord, Villa Florida is one of the largest luxury rental villas you’ll find on the island. Its owners are Dutch, and they’ve been living in Aruba for over 25 years. 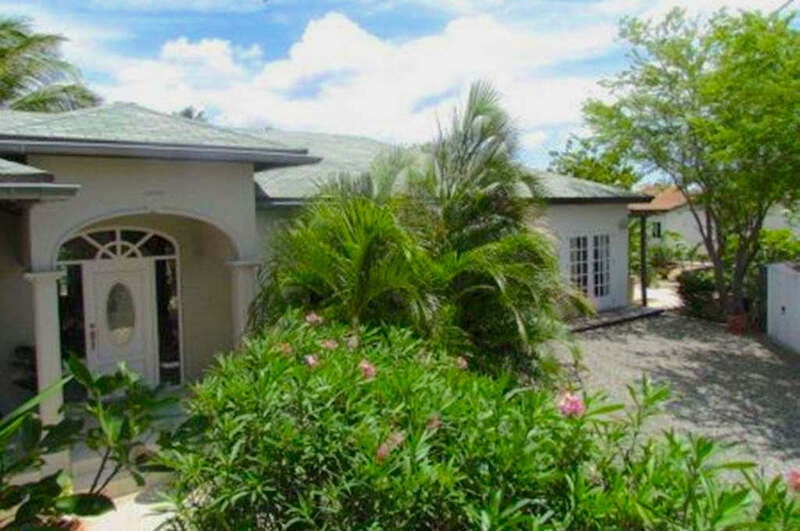 This 3-bedroom villa is located in a safe residential area called Sabana Liber, just about 2 miles east of Palm Beach. It’s a well maintained and modern rental house, where all the rooms are fully furnished and air-conditioned. The living room features a big LCD TV so you won’t miss out on the latest USA news. The beds are super comfortable too, so a good night’s sleep is pretty much guaranteed. The kitchen is fully equipped and has all appliances, including a fully automatic coffee machine. If you need to stock up on supplies, there are a few supermarkets nearby, along the road to Palm Beach. What’s most striking about this rental villa is the size of the outdoor pool though. It’s huge. It’s got a length of 35 feet – just perfect for that late-afternoon dip in the pool after a day on Palm Beach. Poolside, there are plenty of sunbeds for up to 8 people, Aruban palapas, and a snug seating area. There’s a large grill too if you want to hang out at the house and eat with friends or family. To top it off, the house is surrounded by a vast tropical garden, with palm trees, banana plants and typical Aruban flowers where hummingbirds and butterflies come out to play in the cooling breeze. If you’ve got a rental car, you can park it right on the villa’s plaza. The manager can pick you up from the airport. She’ll also bring you up to date about the latest Aruban hotspots, attractions, and some great local restaurants. Villa Florida is hands down one of the best rental villas in Aruba! 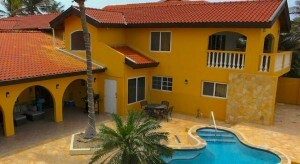 The Parrot Villa, located in Caya Mazurka, Aruba. The Parrot Villa is just a 2 minutes drive (about 300 yards) from the renowned Eagle Beach, which is one of the best beaches in the world, and only 7 kilometers from Queen Beatrix International Airport. The spacious air-conditioned beachfront villa has 3 separate bedrooms, each bedroom features an en-suite bathroom and wardrobe. You’ll love the kitchen, you can cook your own meals if you want. It is well supplied with glassware, a dishwasher, washing machine, and a big American fridge with ice dispenser (great for that cold drink at the pool!) Should you need to stock up on groceries, there’s a grocery store just 2 blocks away. Don’t feel like cooking? A handful of good restaurants, such as the Screaming Eagle Restaurant-Lounge, are just a short car ride or walk away. Fully immerse yourself in Caribbean nature while enjoying the music of parrots and hummingbirds amid the villa’s surrounding tropical garden with outdoor lighting, adding to that laid-back Caribbean feel. If you need to do some work on your computer, there’s free Wi-Fi and a desk with space for a laptop and a chair that’s comfortable to work at. If you’ve arranged a rental car, just park it at the private parking on-site. 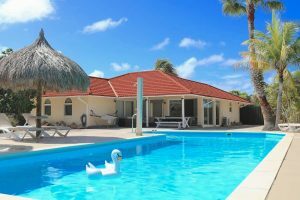 Another good thing about the Parrot Villa is that you do not have anything to worry about once you book with the Aruba Happy Rentals team. They will gladly arrange an Aruba sightseeing tour for you once you arrive. They’ll be there to welcome and assist you 24/7, always standing by to answer any questions you might have. So if you’re looking for an ocean front villa near one of the best beaches in the world, the Parrot Villa is calling your name! 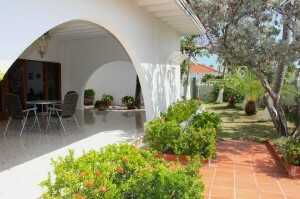 The Bubali rental villas in Aruba, a few minutes from Eagle Beach and Palm Beach. 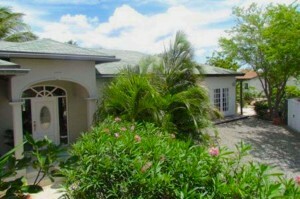 One of the most in demand beachfront villas in Aruba are the Bubali Villas and Apartments. Being in the midst of the tropical forest does not mean you are going to miss the urban world. This villa offers 24-hour free WiFi access, which will enable to you to tweet, update your status, post a picture, or merely let your friends know that you’re on an epic Caribbean vacation. The Bubali Villas and Apartments are near the Bubali Bird Sanctuary, where you will never get bored of watching an enormous number of bird species. If you don’t feel like birds flying over your head, just go to the tower and watch the birds from there. Do not think that Aruba is just a giant nesting of birds because there is another shelter nearby which does not only offer a home to birds but also to mammals. This non-profit organization rescues exotic animals like jaguarundi, a small-sized wild cat abundantly found in Central and South America, potbelly pigs which are native to Asia, as well as the small but terribly powerful Shetland pony. If you feel like cooking yourself, the Superfood Supermarket is just a 3-minute walk from the property. The villa offers a fully equipped kitchen in its apartments, studios, and houses. A fridge and coffee maker are present, but you can always dine out if you want. The famous Screaming Eagle restaurant screams excellence and has boosted Aruba’s reputation as a foodie hotspot. Voted by the Caribbean Journal as the number one restaurant in the Caribbean, this French fusion cuisine serves the best kangaroo entrée, just in case you cannot make it to Australia. Solo Cu Santo, on Sibeliusstraat, Oranjestad, Aruba. The Solo Cu Santo Villa is very accessible because it is in the city of Oranjestad and just a little more than 3 kilometers away from Queen Beatrix International Airport. The accommodation is a home away from home as the units have a dining area and terrace. A fully equipped kitchen with an oven and a dishwasher are available. It is almost four kilometers away from the Hooiberg Mountain, a high volcanic formation. Oranjestad is also the place where you’ll find the oldest structure of Aruba, Fort Zoutman, which served as a military fortification built in 1978 by the Dutch Army. To further enjoy the historic ambiance, visit the National Archaeological Museum Aruba for free. The museum cradles some Indian artifacts, which were the remnants of the Pre- Ceramic period, 2,500 B.C. Surfside Beach, on the other hand, is ideal for a family getaway, bringing children along. The water is perfect for swimming as it is shallow and calm. Because it is near the airport, airplanes are often seen hovering. Near the beach, and also within the city is the Pinchos Grill and Bar. This casual and chic restaurant offers healthy meal grilled items. Enjoy your sumptuous meal in the water surrounded by candle lights while you are to be serenaded by contemporary tunes. This restaurant is also an ideal place to witness Aruba’s mesmerizing sunsets. Solar Villas, located just a 5-minute drive from Eagle Beach. Hence the name, Solar Villa uses eco-friendly solar panels as the source of electrical energy supply to the villa. Strengthening its eco-friendly feature is the usage of low- consumption appliances, water efficient products, and water recycling system. This hidden gem in Oranjestad also provides authentic Aruban culture, if you seek peace from the urban life as it is less modernized than the famous beaches. This villa is near the Druif Beach, a narrow oval- shaped stretch of ivory sand. Best activities to do in this beach are sun tanning, snorkeling, and boat trips. The warm water of the beach is a perfect home for starfish, stingrays, and turtles, which you can witness if you take a dive. One more thing about Druif Beach is that motorized boating is not allowed, definitely a nature-friendly policy. There are two casinos near the place, the Excelsior Casino, which has the largest poker room on the island. The other one is the Glitz Casino, which becomes famous due to its generous payouts in the Caribbean. If you are feeling sporty, you can also visit The Links at Divi Aruba Golf Course. If you get hungry after all these activities, you can dine at the Palm Grill Oceanfront Restaurant, which is located in the western part of Oranjestad. The amazing thing about this dining experience is that you get to grill your food right on your table. Most of the courses are seafood. While you are enjoying the food, you can watch the waves and cool yourself from the flaming grill through the tropical breeze. Just a few blocks from the restaurant you’ll find the Aloe Balm Museum. Due to the tropical climate, the island’s soil is an excellent support to aloe vera plants. Aloe Vera plays a vital role in Aruba for being the top produce of the island, thus boosting its economy. Aruba is the top exporter of these plants. Witness in the museum how aloe vera plants are manufactured to be a moisturizing balm, and probably get a free sample for yourself to nourish your skin after a long day under the Aruban sun. Arashi Beach Villa is located near Palm- and Eagle Beach, and near the city of Oranjestad, about 8 kilometers away. A point of interest to visit near the villa is Arashi Beach. The beach has gentle currents, making it the perfect place for some light snorkeling in the Caribbean. This quiet lick of sand has makeshift huts and a large parking space. If you follow the winding road from Arashi Beach, you will reach the California Lighthouse. This historic lighthouse was designed to warn the ships traveling along the coastline of Aruba. The best thing about the tower is the spectacular view of the island from above. The lighthouse is the go-to place for tourists who’d like to view the coastline with its beaches covered in white sand, rocky coral shorelines and the beautiful landscape of the Tierra del Sol golf course. Also, don’t forget to pass by the California Sand Dunes. This desert landscape features white sand accentuated by green terrains, abundant with cacti, a special safari experience. However, due to environmental concerns, the sand dunes cannot be explored by vehicle but on foot only. Within the lighthouse’s vicinity is an Italian dining place called the Faro Blanco Restaurant. This restaurant serves the best Italian cuisine in Aruba. The Beach House, at Malmok Beach. The Beach House boasts its proximity to Malmok Beach, just twenty steps away. Surrounded by palm trees, this beach house serves as the best place to view the Caribbean Sea. The villa also has Lanai, a Hawaiian roof terrace where you can enjoy outdoor dining or cooking your own food while being refreshed by the tropical breeze from the quiet sea. Kitesurfing and snorkeling are the best things to do at Malmok Beach. Also, the beach is a notable spot for outdoor activities like biking and hiking for your daily fitness routine. The beach leads to other tourist attractions like the California Lighthouse, and the Tierra del Sol Golf Course. Five kilometers away from the beach is The Kitchen by White, an exclusive restaurant that serves eight courses of Aruban cuisine. Many guests already have been impressed with the menu because of its authentic Aruban feel. 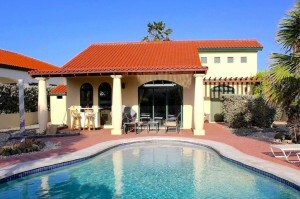 The Sea Shells villa, one kilometer from Boca Catalina Beach. 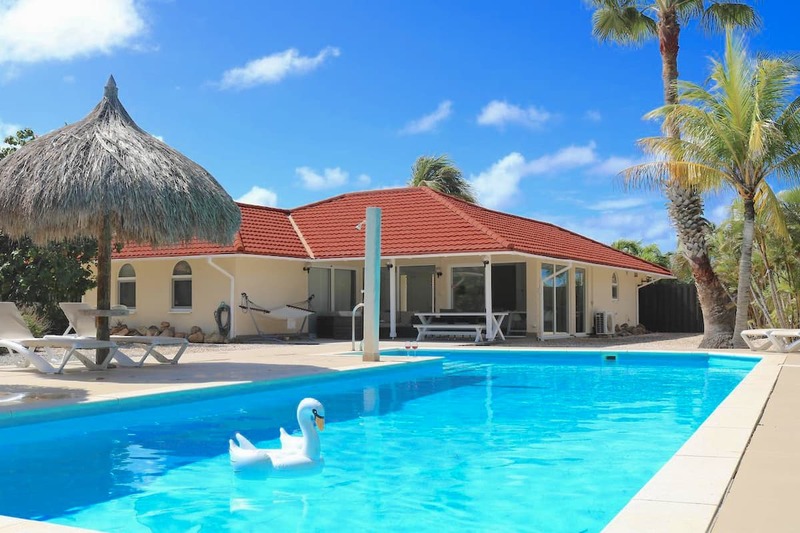 The Sea Shells Villa is a beachfront rental villa in Aruba with three bedrooms, two of which have king size beds, and the other has a queen size bed. The villa features a partial view of the beautiful landscape of Tiera del Sol Golf Course. Never feel afraid in the villa because it has an alarm system. If you worry about the tropical weather, just put the AC on full blast, the villa is fully air-conditioned. Nearby the villa is Boca Catalina, a secluded bay near Malmok Beach. Boca Catalina has crystal clear and calm waters, making it a perfect spot for some light swimming. Snorkeling is also greatly enjoyed by tourists because of many schools of fish in the bay. One kilometer away from Boca Catalina is White Modern Cuisine Restaurant. It offers new and exquisite dining experience. The restaurant integrates mouth-watering dishes with their high-quality cocktails, an absolute luxury. Close to Boca Catalina is the California Lighthouse, which is just a kilometer away. You may also explore the nearby beaches like Palm Beach.